You've installed Fedora without any development stuff on your notebook/workstation, Using thunderbird as the official mail client, using lightning as your default calendar handler. Look at the following image for a description of what happens. The problem could be that, you don't have the libstdc++.so.5 installed on your box. The lightning project also says the same. But the lightning extension fails to detect the presence of the shared library. This html tidy extension does good job of identifying the missing shared library. 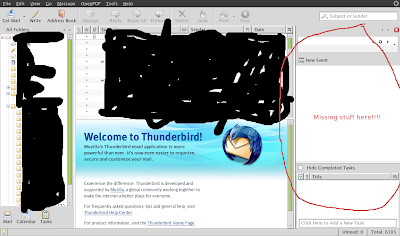 Now, relaunch your thunderbird, lightning will work fine. It took quite sometime for me to figure out whats the real problem is. Hope this trick will help you guys out.